The writing is not yet done, but I did cross the 50,000 word benchmark on Tuesday 11/24/15. Proof, again, that the annual writing retreats help. Making time and space for focused writing helps. Being in a place where the only distractions are the ocean and the sunsets and walks on the beach helps. Being prepared with food and drink and snacks and tons of tea helps. And I did it. I wrote over 50,000 words in the month of November - from 12:01 AM on November 1st until 11:56 pm on November 24th, to be more exact. And my manuscript (in it's very raw form) was validated on the NaNoWriMo website at 11:58 pm. 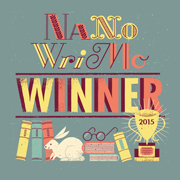 I am a NaNoWriMo Winner!